Objectives: The purpose of the study was to evaluate fracture strength of full-anatomical crowns manufactured from three different types of zirconia with different content of yttrium oxide. Method and materials: A total of 48 specimens were divided into three main groups (n = 16), according to the content of yttrium oxide in the crown material used, as follows: group A, DD Bio ZX2 (3Y-TZP); group B, DD cubeX2 HS (4Y-TZP); and group C, DD cubeX2 (5Y-TZP) (Dental Direkt). After proper surface treatment of different materials, the crowns were adhesively bonded to metal abutments using a dual-curing composite resin (Multilink Automix, Ivoclar Vivadent). Eight specimens from each material group were randomly selected to undergo an artificial aging through dynamic loading and thermocycling in a chewing simulator (Willytec, SD-Mechatronic). After dynamic loading all survived specimens of the first subgroup together with all the specimens of the second subgroup were loaded in a universal testing machine (Zwick Z010, Zwick/Roell). The data were checked for normal distribution with the Shapiro-Wilk test and for homogeneity of the variances with the Levene test. The statistical analyses were done using the Kruskal-Wallis test and in subgroups using the Wilcoxon test. Results: The highest fracture strength median value was shown with the 3Y-TZP after artificial aging (median 7,530 N), while the lowest was shown with the 5Y-TZP after artificial aging as well (median 3,700 N). Conclusions: Increasing the content of yttrium oxide in attempt to improve the optical properties can reduce the mechanical properties after aging of the ceramic as shown in this study. However, even the more translucent 5Y-TZP showed very high fracture resistance, which exceeded 3,000 N. Based on the results of this study, care should be taken when using zirconia with high content of yttrium oxide in areas or situations with high stresses. Objective: The objective was to evaluate the effects of the configuration of endodontic cavities with parallel or divergent walls, versus traditional endodontic cavities, on stress distribution, fracture resistance, and fracture mode of maxillary premolars by using both fracture-strength and finite element tests. Method and materials: Thirty-two maxillary first premolars were divided into four groups (n = 8), according to the type of endodontic cavities: without endodontic cavities (control); conservative; conservative with diverging walls; and traditional. After performing root canal treatment and restoration, fracture resistance was evaluated by oblique compressive load. The stress distribution was evaluated by nonlinear finite element analysis by means of micro-computed tomography, operated at 50 kV and 800 mA. The fracture resistance data were analyzed by statistical software. Results: Higher stress concentration was observed on the coronal portion of the palatal cusp and the palatal root dentin. Stress concentration on the palatal root dentin was similar for all groups. The stress level on the palatal cusp and at the proximal crests was slightly increased in the traditional endodontic cavities group compared with conservative endodontic cavities. Stress distribution in restored teeth was similar to that of intact teeth. No significant differences were observed in the fracture resistance among different endodontic cavities' design (P = .32). All groups had values similar to those of the control group (P > .05). Conclusions: Regardless of the cavity design, conservative endodontic cavities that preserve marginal ridge integrity did not affect the resistance to fracture, failure mode, or stress distribution in maxillary premolars restored with composite resin. Endodontically treated teeth displayed biomechanical behavior similar to sound teeth. 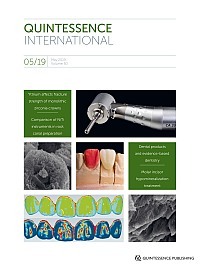 Objectives: To examine various parameters of root canal preparation using three rotary nickel-titanium systems (S5, Mtwo, and ProTaper Universal [PTU]). Method and Materials: One hundred and twenty curved root canals were prepared to size 30. The following parameters were evaluated: straightening, changes of root canal cross-section, safety issues, cleanliness of canal walls, and working time. Statistical analysis was performed with the Kruskal-Wallis test, Wilcoxon-Mann-Whitney test, and analysis of variance (P < .050). Results: All three systems maintained the curvature well with no significant difference between the groups. With regard to the cross-section, no significant differences for any of the root canal thirds (coronal, P = .589; medial, P = .898; apical, P = .474) were found. Preparation with S5 resulted in two, with Mtwo in one, and with PTU in three procedural incidents. Debris scores 1 and 2 were found in 56% (S5), 46% (Mtwo), and 60% (PTU) of the specimens, respectively. Smear layer scores 1 and 2 were found in 85% (S5), 73% (Mtwo), and 78% (PTU). Results for removal of debris and smear layer were not significantly different between the three groups. Mean working time was significantly shorter for Mtwo (293 seconds) than for S5 (329 seconds) (P = .001) or PTU (369 seconds) (P = .001). Conclusion: All three systems respected the original root canal curvature well and were safe to use. None of the three systems was able to prepare the entire circumference of the root canals, and to remove debris and smear layer completely. Cause-related therapy is key in the management and resolution of the two most common oral diseases: dental caries and periodontal disease. This is the first phase of treatment for those diseases. The aim is to remove, reduce, or eliminate the main causes of the disease. When referring to caries and periodontal disease, the primary etiology is bacterial plaque so the cause-related therapy phase should include plaque control as a major component. This can be achieved by constantly and continuously educating patients about the pathophysiology of the diseases and by helping them develop proper daily plaque removal techniques. Furthermore, various professional therapeutic interventions are delivered as necessary to eliminate or suppress other etiologic or risk factors. In this case series, the principles of proper cause-related therapy are demonstrated through three cases that were successfully managed by nonsurgical periodontal therapy. Biologic and clinical rationales are also discussed. Objective: The current design methods for the surface texture of prostheses are unsatisfactory: the line-drawing method relies heavily on the subjective experience of technicians, and the powder-coating method requires high costs. A new innovative method is proposed: curvature-analysis with reverse engineering. The objective was to compare operation times and esthetic parameters in generating surface textures among the three methods. Method and materials: Twenty-seven patients with maxillary central incisor fixed dental prostheses were randomly divided into three groups, and prostheses were built by three technicians using line-drawing, powder-coating, or curvature-analysis methods, respectively. Porcelain grinding times were recorded. The final prostheses were analyzed regarding the three-dimensional deviation from the control group that used the contralateral tooth. A senior technician and clinician made a single-blind evaluation of the prostheses' surface texture. Results: In the curvature-analysis method, large, medium, and small curvatures effectively showed an intrinsic labial surface, the developmental groove, and other surface morphology structures, respectively. Operation times in the line-drawing, powder-coating, and curvature-analysis methods were 19.51 ± 0.95, 16.87 ± 1.30, and 12.41 ± 0.94 minutes, respectively, with statistically significant differences among the three methods; evaluation scores were statistically significantly different between the line-drawing and curvature-analysis methods. The three-dimensional deviation root mean square values were 0.451 ± 0.083, 0.396 ± 0.029, and 0.295 ± 0.080 mm, respectively, indicating curvature analysis had the smallest three-dimensional deviation. Conclusions: Curvature analysis helps manufacture the surface texture accurately with enhanced efficiency, improving esthetics and reducing operation time and material waste. Objective: A novel device for intraoperative compressive testing of alveolar bone during implant surgery has been introduced. It was the goal of this study to compare the performance of this device with traditional methods used for determining alveolar bone quality and primary implant stability. Method and materials: Implant surgery in human cadaver bone was performed by two implantologists differing in experience. Bone quality was rated radiographically, based on tactile sensation during drilling and using intraoperative compressive tests. Implant stability was evaluated using insertion torque measurements and resonance frequency analysis. Statistical analysis was based on two way ANOVA followed by Tukey multiple comparisons and Pearson's product moment correlation. The level of significance was set at α = .05. Results: Human cadaver bone was ranked according to implant insertion torque. Radiographic assessment, tactile sensation during drilling, and implant stability measurements did not allow differentiating bone types in all instances. Cortical BoneProbe measurements showed a significant trend towards higher measurement values in greater bone quality types (P < .01); in trabecular bone this trend was also present but was not statistically significant. Significant correlations existed between BoneProbe measurements and most other parameters evaluated. Conclusion: Despite the limited number of measurements performed, intraoperative compressive testing of bone may be an option for objectively classifying alveolar bone quality. Objectives: This research aims to confirm the association between dyslipidemia, oral health behaviors, and periodontal disease according to age groups. Method and materials: This cross-sectional study used collected data from the Korea National Health and Nutrition Examination Survey (KNHANES) conducted from 2012 to 2015 with 17,004 adults. Complex samples logistic regression analysis confirmed the relevant factors of oral disease. Results: Hypo high-density lipoprotein cholesterol (HDL-C) related to periodontal disease in two groups (under 40 and over 40 years old). In the over-40 age group, the level of low-density lipoprotein cholesterol (LDL-C) was associated with periodontal disease; toothbrushing frequency and usage of interdental hygiene products were associated with periodontal disease. Conclusions: Better HDL-C level in all age groups, management of LDL-C level, tooth-brushing at least twice a day, and additional use of interdental hygiene products in the over-40 age group were associated with better oral health. Thus, public and oral health professionals should emphasize the relationship according to age group during health care education and share relevant information. Dentists make frequent product recommendations to their patients. Many dental products are intended to exert a therapeutic action such as caries prevention or desensitization. The purpose of this article is to highlight the contributions the principles of evidence-based dentistry (EBD) can make in guiding therapeutic product recommendations. Dental practitioners are exposed to product claims in advertising and in the professional literature. All studies are not equivalent in making treatment decisions. Although useful for screening active ingredients and providing other background information, laboratory studies should not directly inform clinical decision-making. Properly designed and conducted randomized controlled clinical trials assess the impact of an intervention on a disease-relevant outcome measure (like pain scores or periodontal pocket depth). Where available, systematic reviews can help clinicians determine if there are trends and agreement in clinical trial results. Clinical studies need to be evaluated for publication and other forms of bias. In order to use study results in clinical decision-making, the clinical significance of the trial results must be considered. Determining that a result is statistically significant is inadequate since it does not inform the clinician of the magnitude of the treatment effect. Although clinical studies may generate observations that are valid for the conditions and selected population that was used in the trial, the results may not predict how well an intervention will work in actual use by a diverse group of consumers. In order to better inform clinical judgment, practice-based research networks examine the effectiveness of interventions under real-world circumstances. Applying these basic EBD principles should allow dental practitioners to use consumer products to promote oral health. Objective: This article describes the esthetic results in a paradigmatic case of hypomineralized enamel correction on both anterior and posterior teeth to establish a minimal intervention protocol for similar cases. Clinical considerations: The subject was initially provided with casein-calcium-phosphate mineral supplementation. Unpublished laboratory images collected as part of a previously published study depict the results of initial calcium-phosphate supplementation on molar incisor hypomineralization (MIH) molar enamel morphology and indicate that this procedure is mandatory in moderate/severe cases. Prior to defect restoration, in-office bleaching of the anterior segment was conducted with bioactivated Opalescence Boost. Filtek Supreme Ultra Universal Restorative was used as a masking agent, and Filtek A2 enamel was applied as the final layer. Conclusion: An 8-year follow-up period is necessary in most moderate/severe MIH cases involving orthodontics and bleaching.